In the wake of Khalil's deathl, Jennifer struggles with her anger and desire for revenge against Tobias. Anissa returns to work at the clinic, only to be inspired to an act of vigilantism outside of her Thunder suit when she treats a survivor of domestic abuse. Meanwhile, Gambi makes a starting discovery, after a group of men try to abduct Lynn. P.J. Byrne perfectly plays Principal Lowry as the kind of clueless, casually racist idiot you can't help but want to see smacked around even if you wouldn't punch him yourself on general principal. The funeral sequence is beautifully shot with fantastic music and blocking. Most of the comics in Grace's apartment are real world DC Comics titles. We can even see an advertisement for the 1984 Supergirl movie on Blu-Ray on the back of the issue that Grace is holding while asleep. The Black Lightning and Thunder comics we see, however, are not real. Anissa: I think she wants time to be alone, to be alone. Lynn: Well, alone is good until it's not good. Isolation feeds depression and addiction. I just think she needs her family right now. Anissa: You and Dad always think you know what's best for us. But what if it's not true? What if, every once in a while, we know what's best for us? Jennifer: (scoffs) How am I doing? I don't know how I can be in so much pain and not bleed. Jefferson: Jennifer, the power to do amazing things comes with the responsibility to do the right thing. Revenge is not the right thing, justice is. Jennifer: You can't remove him from us. You can't make us not remember him. Every single person standing here is just one bad break away from becoming somebody they never meant to be. Principal Lowry: This is your last chance! Jennifer: Can anyone here say that if they were crippled and you had the opportunity to walk again, you wouldn't take it? Jennifer: We're all in pods. You know that, right? Just like the kids on the news, right? Trapped by a system that doesn't give a damn about us, run by people like you. Principal Lowry: Take her. All right, come on. Clear a path. Let's go. Jennifer: No, it's okay. Stay strong, everyone. Principal Lowry: No, no, no, no, no. No kneeling down. And let's put the cell phones away. Put the phones away. You know this is an illegal assembly, right? You are in violation of your student handbook! Principal Lowry: Will you tell them to get off their butts and back to class? Jefferson: Sounds like the principal's job. Lynn knows that Jennifer smokes. Anissa says she's cut back since starting therapy. Anissa warns Lynn against smothering Jennifer and suggests they give her space as she copes with Khalil's death. Anissa is shot and Lynn nearly abducted by a group of men in the grocery store parking lot. The agents are scared off by ASA Agent Odell. Khalil's mother can't afford to bury him. Gambi thinks that Odell is having Lynn tailed as that's the only way he could have been there to save her. He doesn't think this means that Odell knows Jefferson is Black Lightning. Gambi is also uncertain if someone honestly was trying to abduct Lynn or if Odell was just trying to make Lynn feel gratified to him by his thwarting the abduction attempt. Gambi doesn't find any bugs in the Pierce house, suggesting that Lynn is being followed by the ASA. When confronted about why Odell is having her followed, Odell repeats his line about how he doesn't have time for Lynn not to be honest with him after she lies about Anissa not being shot. Todd reports that the metas they recovered from the clinic are stable and that the crew which moved them "took a one-way trip with Cutter." Tobias is pleased by this news. Lynn and Jefferson discuss the possibility of Jennifer returning to regular high school, since she was able to control her powers well enough to hide from them and Tobias. Jennifer asks Jefferson to start training her so they can take out Tobias. Jefferson tells her that justice, not revenge, is why he does what he does. Odell identifies the men who tried to abduct Lynn as Markovians. He believes they wanted her for her expertise in dealing with metahumans. Odell offers to let Dr. Jace go free if she can move the Green Light Babies safely to a new location and keep them alive. Dr. Jace says she'll need Lynn's help to do it. Anissa treats a woman named Monique at the free clinic who looks like she was beaten. When Anissa asks how she was injured, she says she probably fell down the stairs or blacked out but she insists that nobody hurt her. A nurse later tells Anissa that the woman's boyfriend is a capo in The 100 named Rayvon and that so long as they look the other way and don't log her treatment, they all get to live. The Markovians try to abduct Perrena. She forces them to let go of her by psychically making them imagine they are freezing to death. Jennifer returns to school at Freeland High. Grace is now working in a comic book store. There are comics based on Black Lighting and Thunder. Anissa's black-clad persona who robs criminals and gives to the poor has become known as The Black Bird on the street. Anissa attacks Rayvon. She barely gets away, however, as she once again has the wind knocked out of her, which stops her from using her powers. Jennifer almost loses control of her powers when she finds the janitors tearing down a student made memorial to Khalil. Jennifer rebuilds the memorial to Khalil and leads a student protest when Principal Lowry tries to have it torn down. Jefferson backs the students when Lowry demands he tell them to get back to class. Anissa gives the last bit of money she stole to a funeral home to pay for Khalil's funeral. Dr. Jace is brought in to help facilitate the Pod Kids being moved, over Lynn's objections. Yuri Bakonov is a Markovian Intelligence Service agent who was the driver of the team that tried to kidnap Lynn. Jefferson attacks the Markovian agents and reports them to Deputy Chief Handerson. We are told that Monique has left Rayvon and is trying to rebuild her life. Principal Lowry complains to Jefferson that the real racism in America is everyone assuming he has it easy because he's white. He says that his parents were heroin addicts and that his mom overdosed while his dad watched, and that he was homeless and ate dog food to survive. Grace does not like action movies. Anissa loves action movies, particularly ones with a woman in the lead. Grace says she loves Anissa's lust for life and spontaneous nature. Grace's eyes suddenly change color while she's talking with Anissa on a walk through the park. Grace runs off as her tattoos shift again, like they did before in 205. Todd determines that a metahuman research program at Leavenworth occurred at the same time as the ASA Green Light Vaccine experiment. The ASA took the Leavenworth successes and turned them into black-out operatives for a time but they committed atrocities which were covered up.Todd confirms these covert agents are the same people they book out of the secret room in the Freeland Free Clinic. Yuri Bakonov had diplomatic immunity and was sent back to Markovia. Anissa goes to Grace's apartment after the funal, but she isn't there. Todd says the technology used to keep the metahuman black-out operatives on ice is so ancient he has no idea what to do with it. Tobias tells him to cancel the kill order on Dr. Jace and make arrangements for her to be employed in a more permanent capacity. Jennifer promises as Khalil is lowered into the ground that Tobias will be joining him there soon. 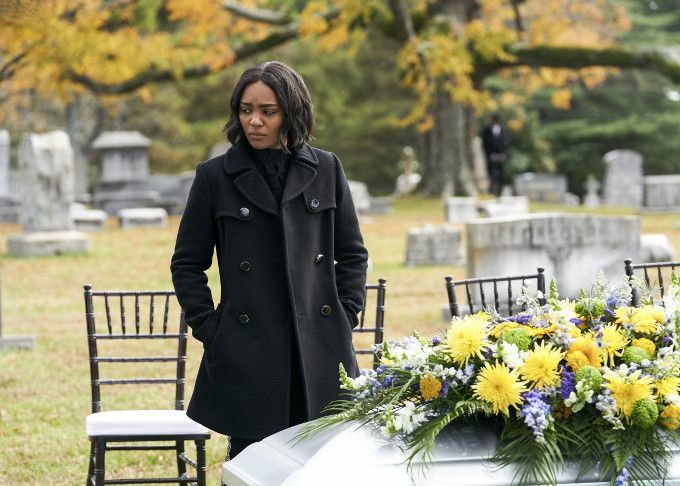 Agent Odell is watching Jennifer as she leaves the funeral. A solid episode which revives a lot of subplots long dead. (Seriously, when was the last time we saw Jefferson in the school?) We still have no idea what is going on with Grace but at least this week gave the whole cast something to do even if it was light on action.